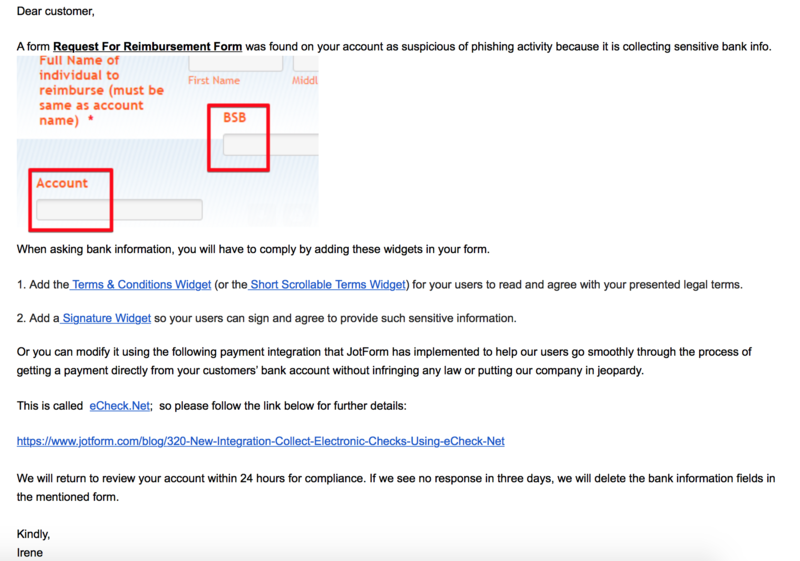 I received an email from JotForm about a "suspicious form" that was flagged for phishing fields. I have deleted the form and changed my password... however I never created the form that was mentioned. Have you all had issues with fraudulent forms on accounts? You probably cloned a form that has fields asking for account or banking information. Our reviewers team email the owner of the form informing them that in order for your form to be compliant is you will need to add the suggestions like what you receive in your form. 2). Add a signature widget so users will sign and agree that their information will be sent to the form. If you add these to your form, your form will no longer be flagged. Let us know if you have any questions or if you need further assistance.